What did it mean to be a ‘man’ in 1950s Australia? 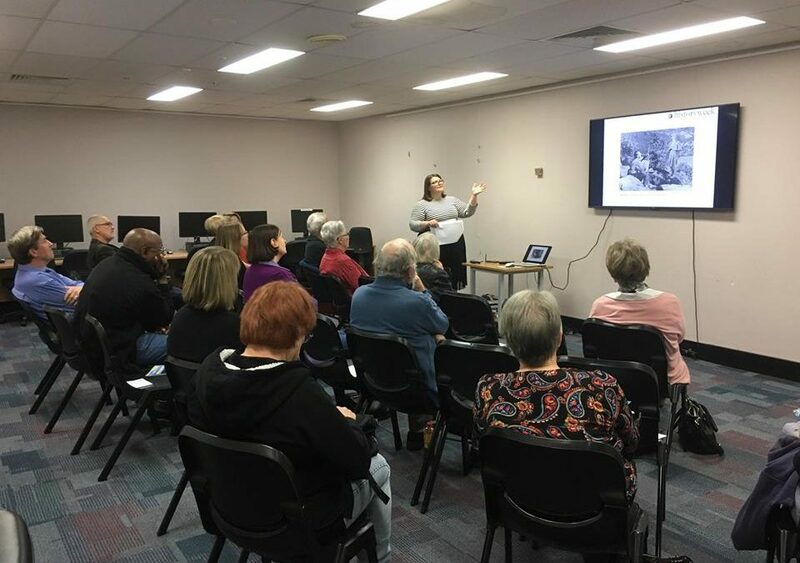 To celebrate History Week 2017, Lake Mac Libraries hosted Dr Chelsea Barnett for an insightful and thought provoking Speaker Connect talk: ‘What sorta man are you anyway’: Contested Masculinities in Australian Postwar Cinema. Drawing on research she conducted as part of her PhD (completed Macquarie University, 2016), Chelsea explored how masculinity was both constructed and represented in Australian feature films of the 1950s. Chelsea argued that although the 1950s is a period remembered for its stability and rigid gender roles, it was, in fact, an era during which contested masculinities were to be played out on the silver screen. Chelsea began by emphasising that the 1950s is a period remembered by many as one of stability, characterised by rigid gender roles and with the nuclear family on the centre stage. However, Chelsea argued that the post-war family unit did not function as smoothly as we might think: it was much more complex and most importantly ‘fragile.’ Its stability relied on each family member fulfilling the particular role which they were assigned, whether that be the ‘breadwinner,’ the ‘housewife’ or the ‘obedient’ child. During the 1950s, Australia’s Prime Minister Robert Menzies played an important role in reinforcing the ideal of the ‘breadwinning’ father. As a result, middle-class masculinity became deeply connected to the roles of husband and father. However, not all Australian men conformed to and successfully fulfilled this role. Opposition to it saw the emergence of a radical nationalist mode of masculinity rejected the notion of the stable and reliable ‘breadwinning’ father and husband. Instead, it celebrated the working-class father, who was rugged and independent, and whose loyalty lied not with his family but with his mates. Therefore, Chelsea suggested, we should think of the 1950s as a “dynamic” moment in Australian history when post-war masculinity was anything but stable and instead was nuanced, complex and often contradictory. To demonstrate this dynamic moment, Chelsea took the audience on a journey back in time and discussed how three Australian feature films showed and dealt with the tensions surrounding 1950s Australian masculinity. The first of these films, Wherever She Goes (1951), tells the story of the early life of Australian Pianist Eileen Joyce. The film presented a complex picture of fatherhood and probed the tensions surrounding competing modes of masculinity. The second film, The Sundowners (1960), explored the differences between the wandering, liberated father and the settled, reliable father, and the tensions this created between husband and wife. The third film, The Shiralee (1957), explored the tensions between the middle-class father and the working-class father, and raised questions about what it meant to be both a father and a man in 1950s Australia. Thank you also to Dr Chelsea Barnett, Julie Dunn and the entire team at Lake Mac Libraries for their hard work in bringing about this event. This event was proudly presented as part of the History Council of NSW’s Speaker Connect program for History Week 2017, supported by Create NSW. It was also part of History Illuminated, Lake Macquarie’s inaugural festival of history.